<h2>Waste CO2 to be turned into ingredients for fuel, plastics and even food</h2><br /><p>It’s part of a strategy to halt global warming by cutting down the amount of CO2 we vent into the air and then re-using it - a technique known as carbon capture and utilisation (CCU).</p> <p>At a facility run by Carbon Recycling International (CRI) beside the picturesque Blue Lagoon in southwest Iceland, water, energy and waste carbon dioxide from a nearby geothermal power station are being used to make methanol, which can be blended with petrol to power cars or turned into a range of chemicals.</p> <p>‘We take CO2 originally dissolved in the steam coming from underground and we re-use some of it as a raw material in our process,’ said Ómar Freyr Sigurbjörnsson, former research director and now head of sales and marketing at CRI.</p> <p>CRI built their demo plant in 2012 and became the world’s first company to produce and sell methanol made from waste CO2. Since 2014, the plant can manufacture around 4,000 tonnes of methanol per year, which is sold in other European countries.</p> <p>This amount is a drop in the ocean for now, since around 80 million tonnes of methanol are made annually. Through a project called <a href="https://cordis.europa.eu/project/rcn/213328_en.html">Circle Energy</a>, CRI is conducting a feasibility study on scaling up its operations. CRI aims to construct dozens of facilities in Europe that combine renewable energy with waste CO2 gas to make methanol, starting with a much larger facility in Norway, where it will use hydropower to make 100,000 tonnes of methanol each year. The plan is to start building soon and complete the facility by 2021.&nbsp;</p> <p><strong>Sustainable</strong></p> <p>CRI’s process is far more sustainable than regular methanol production. In Europe and the US, most methanol is made using natural gas, whereas in China coal is used.</p> <p>The CRI process kicks off by using the renewable energy to electrolyse water, which is a way of breaking H<span style="font-size: 10pt;">2</span>O molecules into oxygen and hydrogen using electricity. The hydrogen is reacted with the waste CO2 with the aid of special chemicals called catalysts. This yields methanol, which is made up of four atoms of hydrogen, one of carbon and one of oxygen. The only waste gas is oxygen, which is emitted into the air or used in other ways.&nbsp;</p> <p>In Norway, CRI will use renewable energy and waste CO2 gas from nearby industry to manufacture greener methanol, which will then go into paints, plastics, solvents, glue, fuel components, and more. This way of making methanol reduces carbon emissions by 90% compared to using fossil fuels.&nbsp;</p> <p>‘We are able to sell in the same fuel markets in Europe as other fossil fuel methanol, but we get a premium price,’ said Sigurbjörnsson.</p> <p>Methanol can also be stored and transported from renewable energy production sites to where consumers are. ‘We can convert renewable energy into chemical energy that can be stored for a long time, and it can be moved long distances without losing energy. It has these advantages over say battery technology,’ said Sigurbjörnsson.</p> <p> <div class="quote-view quotesBlock quote_horizontal"> <div class="quotesTop"><img src="https://horizon-magazine.eu/sites/all/themes/horizon/images/quotes_top.png" alt="" title="" /></div> <p>‘CO2 is a waste, so it really has to be a cheap process that leads to an interesting component.’</p> <blockquote><p>Professor Patricia Luis Alconero, UC Louvain, Belgium</p></blockquote> <div class="quotesBottom"><img src="https://horizon-magazine.eu/sites/all/themes/horizon/images/quotes_bottom.png" alt="" title="" /></div> </div> </p> <p>CRI, which has worked out how to use residual gases from industries such as steel and iron making, also plans to put waste CO2 from power plants and cement factories to good use.</p> <p>‘We plan to have more partners co-invest with us, such as power companies, chemical companies and different industries,’ Sigurbjörnsson said. ‘Our focus is on developing the technology and licensing and selling the equipment that goes with it.’</p> <p>This can lower emissions but won’t swallow all of industry’s CO2.</p> <p><strong>Report</strong></p> <p>The <a href="https://www.ipcc.ch/report/sr15/" target="_blank" rel="noopener noreferrer">recent landmark report</a> from the Intergovernmental Panel on Climate Change warned that the world needs to limit temperature rise to 1.5°C. This requires many solutions and multiple technologies.</p> <p>‘Since the industrial sector emits 40% of all carbon dioxide, we are trying to capture it from the chimney and do something useful with it,’ said Professor Patricia Luis Alconero at UC Louvain in Belgium, who has just begun an ambitious project to turn waste CO2 into useful chemicals.&nbsp;&nbsp;&nbsp;</p> <p>Her project, <a href="https://cordis.europa.eu/project/rcn/212331_en.html" target="_blank" rel="noopener noreferrer">CO<sub>2</sub>Life</a>, is inspired by nature. ‘Our process looks at the way nature takes up CO2 for its own ends.&nbsp;We try to copy nature's use of enzymes, but in a way that is more efficient and which uses membrane technology,’ she said.</p> <p>Current technology for capturing carbon uses liquid amines, expensive and toxic chemicals with great affinity for CO2 molecules, but the cost and sustainability of the process are of concern. In order to generate energy and to capture CO2 in a fossil fuel power plant, for instance, an additional 30% more energy needs to be generated.</p> <p><strong>Membranes</strong></p> <p>To develop this membrane-based process, Prof. Luis Alconero is using amino acid salts and enzymes that will capture and convert CO2 molecules into useful chemicals. In a second step, also using membranes, the chemicals will be crystallised and recovered as pure materials for use by industry.&nbsp;&nbsp;</p> <p>‘This process is flexible since depending on the enzymes we use, we can get different chemicals,’ she said. Examples include carbonate salts, such as sodium or calcium carbonate, a raw material for the cement industry, or glucose.</p> <p>Other high-value possibilities are pure compounds that could be valuable to the food industry. It is the cost of turning CO2 into something useful and the value of that material that determines whether the process sinks or swims.&nbsp;</p> <p>‘CO2 is a waste, so it really has to be a cheap process that leads to an interesting component,’ said Prof. Luis Alconero, who aims to build a prototype system.</p> <p>‘Our objective is to come up with a solution that is more environmentally friendly than amines and also to solve the economic issues,’ she said.</p> <p> <div class="moreInfoBlock"> <h3>The Issue</h3> <p>In June, the European Commission's Group of Chief Scientific Advisors&nbsp;delivered an&nbsp;<a href="https://ec.europa.eu/research/sam/pdf/sam_ccu_report.pdf#view=fit&amp;pagemode=none" target="_blank" rel="noopener noreferrer">opinion</a>&nbsp;on <a href="http://ec.europa.eu/research/sam/index.cfm?pg=ccu" target="_blank" rel="noopener noreferrer">novel&nbsp;carbon capture and utilisation (CCU) technologies</a>. This was conducted under the <a href="http://ec.europa.eu/research/sam/index.cfm?pg=home">Scientific Advice Mechanism </a>which supports the Commission with independent, timely scientific advice designed to guide future EU policies.&nbsp;</p> <p>They assessed technologies&nbsp;which include carbon capture, conversion and generating hydrogen and concluded that CCU can help the EU reach its mitigation targets. Implementing these technologies, many of which are still being developed, will depend on getting lawmakers and businesses on board, according to the opinion. In addition, if the fossil carbon stays in the ground, CCU can help ‘close the carbon loop above the ground’.</p> </div> </p> <p><em>The research in this article was funded by the EU. If you liked this article, please consider sharing it on social media.</em></p> <br /> <img src=”http://www.google-analytics.com/collect?v=1&tid=UA-40077089-1&cid=waste-co2-to-be-turned-into-ingredients-for-fuel-plastics-and-even-food&t=event&ec=republish&ea=read&el=waste-co2-to-be-turned-into-ingredients-for-fuel-plastics-and-even-food&cs=republish&cm=republish&cn=republish&cm1=1" /> This post <a href="https://horizon-magazine.eu/article/waste-co2-be-turned-ingredients-fuel-plastics-and-even-food.html">Waste CO2 to be turned into ingredients for fuel, plastics and even food</a> was originally published on <a href="https://horizon-magazine.eu/">Horizon: the EU Research &amp; Innovation magazine | European Commission</a>. Scientists are ramping up efforts to turn waste CO2 from industry into chemicals such as methanol in a bid to reduce emissions and provide a new source of raw materials for use in fuel, cement and food production. It’s part of a strategy to halt global warming by cutting down the amount of CO2 we vent into the air and then re-using it - a technique known as carbon capture and utilisation (CCU). Storing CO2 underground can curb carbon emissions, but is it safe? 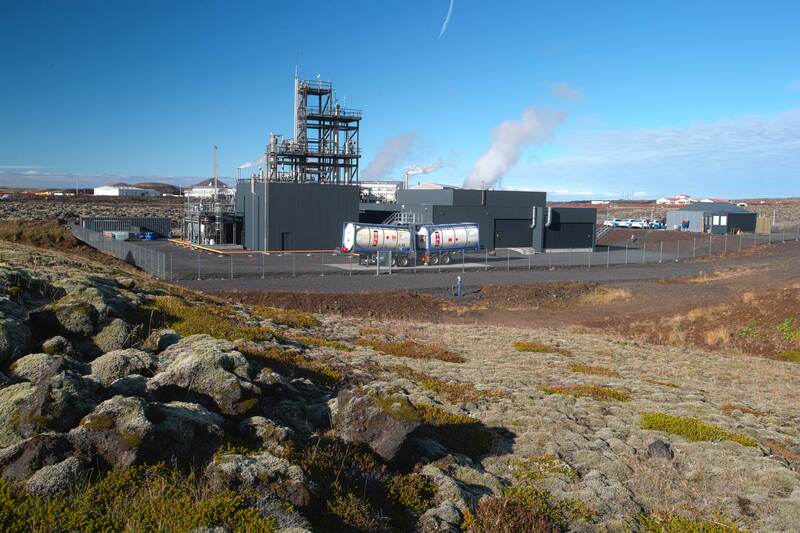 At a facility run by Carbon Recycling International (CRI) beside the picturesque Blue Lagoon in southwest Iceland, water, energy and waste carbon dioxide from a nearby geothermal power station are being used to make methanol, which can be blended with petrol to power cars or turned into a range of chemicals. ‘We take CO2 originally dissolved in the steam coming from underground and we re-use some of it as a raw material in our process,’ said Ómar Freyr Sigurbjörnsson, former research director and now head of sales and marketing at CRI. CRI built their demo plant in 2012 and became the world’s first company to produce and sell methanol made from waste CO2. Since 2014, the plant can manufacture around 4,000 tonnes of methanol per year, which is sold in other European countries. This amount is a drop in the ocean for now, since around 80 million tonnes of methanol are made annually. Through a project called Circle Energy, CRI is conducting a feasibility study on scaling up its operations. CRI aims to construct dozens of facilities in Europe that combine renewable energy with waste CO2 gas to make methanol, starting with a much larger facility in Norway, where it will use hydropower to make 100,000 tonnes of methanol each year. The plan is to start building soon and complete the facility by 2021. CRI’s process is far more sustainable than regular methanol production. In Europe and the US, most methanol is made using natural gas, whereas in China coal is used. The CRI process kicks off by using the renewable energy to electrolyse water, which is a way of breaking H2O molecules into oxygen and hydrogen using electricity. The hydrogen is reacted with the waste CO2 with the aid of special chemicals called catalysts. This yields methanol, which is made up of four atoms of hydrogen, one of carbon and one of oxygen. The only waste gas is oxygen, which is emitted into the air or used in other ways. In Norway, CRI will use renewable energy and waste CO2 gas from nearby industry to manufacture greener methanol, which will then go into paints, plastics, solvents, glue, fuel components, and more. This way of making methanol reduces carbon emissions by 90% compared to using fossil fuels. ‘We are able to sell in the same fuel markets in Europe as other fossil fuel methanol, but we get a premium price,’ said Sigurbjörnsson. Methanol can also be stored and transported from renewable energy production sites to where consumers are. ‘We can convert renewable energy into chemical energy that can be stored for a long time, and it can be moved long distances without losing energy. It has these advantages over say battery technology,’ said Sigurbjörnsson. CRI, which has worked out how to use residual gases from industries such as steel and iron making, also plans to put waste CO2 from power plants and cement factories to good use. This can lower emissions but won’t swallow all of industry’s CO2. The recent landmark report from the Intergovernmental Panel on Climate Change warned that the world needs to limit temperature rise to 1.5°C. This requires many solutions and multiple technologies. ‘Since the industrial sector emits 40% of all carbon dioxide, we are trying to capture it from the chimney and do something useful with it,’ said Professor Patricia Luis Alconero at UC Louvain in Belgium, who has just begun an ambitious project to turn waste CO2 into useful chemicals. Her project, CO2Life, is inspired by nature. ‘Our process looks at the way nature takes up CO2 for its own ends. We try to copy nature's use of enzymes, but in a way that is more efficient and which uses membrane technology,’ she said. Current technology for capturing carbon uses liquid amines, expensive and toxic chemicals with great affinity for CO2 molecules, but the cost and sustainability of the process are of concern. In order to generate energy and to capture CO2 in a fossil fuel power plant, for instance, an additional 30% more energy needs to be generated. To develop this membrane-based process, Prof. Luis Alconero is using amino acid salts and enzymes that will capture and convert CO2 molecules into useful chemicals. In a second step, also using membranes, the chemicals will be crystallised and recovered as pure materials for use by industry. ‘This process is flexible since depending on the enzymes we use, we can get different chemicals,’ she said. Examples include carbonate salts, such as sodium or calcium carbonate, a raw material for the cement industry, or glucose. Other high-value possibilities are pure compounds that could be valuable to the food industry. It is the cost of turning CO2 into something useful and the value of that material that determines whether the process sinks or swims. ‘CO2 is a waste, so it really has to be a cheap process that leads to an interesting component,’ said Prof. Luis Alconero, who aims to build a prototype system. ‘Our objective is to come up with a solution that is more environmentally friendly than amines and also to solve the economic issues,’ she said. In June, the European Commission's Group of Chief Scientific Advisors delivered an opinion on novel carbon capture and utilisation (CCU) technologies. This was conducted under the Scientific Advice Mechanism which supports the Commission with independent, timely scientific advice designed to guide future EU policies. They assessed technologies which include carbon capture, conversion and generating hydrogen and concluded that CCU can help the EU reach its mitigation targets. Implementing these technologies, many of which are still being developed, will depend on getting lawmakers and businesses on board, according to the opinion. In addition, if the fossil carbon stays in the ground, CCU can help ‘close the carbon loop above the ground’.